Nicotine should be freely available in products which do not carry cigarettes' health risks, to help smokers who find it impossible to quit, say doctors. Millions continue to smoke because they are addicted to nicotine, but it is the toxins in cigarette smoke that kill, said the Royal College of Physicians. It called for the regulation of new cigarette substitute products to give the "nicotine hit" that smokers crave. The Department of Health said it would consider the RCP report. 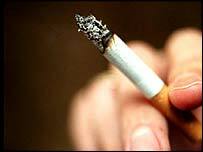 The RCP said its proposals could help to prevent millions of deaths and would particularly help the worst off, who tend to smoke more heavily and find it harder to stop. Professor John Britton, report author and chairman of the RCP tobacco advisory group, said: "Smokers smoke because they are addicted to nicotine, but it isn't nicotine in cigarette smoke that kills - it's the hundreds of other toxic chemicals that come with it. "The best thing that a smoker can do for his or her health is to quit all smoking and nicotine use completely. "However, there are millions of smokers who can't quit, or else who are unlikely to quit, and those people need nicotine products that can satisfy their addiction without killing them." Almost a quarter of adults in the UK currently smoke and fewer than 5% of smokers manage to quit every year, despite most saying they would like to. Manufacturers should be encouraged to develop safe nicotine sources, which might be as addictive as cigarettes, for smokers, the RCP report concluded. But current medicines regulation in the UK actively discourages the development, marketing and promotion of cigarette substitutes containing nicotine because it is addictive. Current nicotine replacement therapy, such as chewing gum, delivers the drug at a much lower dose than in cigarettes to help wean people off their craving. More research should be done on the effectiveness and safety of other forms of tobacco as alternatives to smoking, the RCP also said. Smokeless products such as snus, which is widely available in Sweden but banned in the EU, may be safer than smoking and be an acceptable alternative for smokers, although not without health risks, the RCP said. Professor Britton, who is also an expert in epidemiology at the University of Nottingham, said the concept was controversial as some saw it as "encouraging addiction". "If lots of people stop smoking but switch to medicinal nicotine products, it would be no more harmful than the existing use of caffeine," he said. Action on Smoking and Health and Cancer Research UK backed the report's recommendations. Jean King, Cancer Research UK's director of tobacco control, said: "If nicotine can be provided in a form and at a price that offers a far more attractive and accessible alternative to smoking than at present, many lives could be saved." But Professor Martin McKee, an expert in European public health at the London School of Hygiene and Tropical Medicine, said there should be a clear distinction between nicotine replacement therapy, which had been proven to be safe, and types of smokeless tobacco such as snus. "What we're very concerned about is that tobacco companies have been pushing for legalisation of snus, which would undermine the impact of the smoking ban because it would keep people addicted rather than encourage them to quit." The Department of Health said reducing rates of smoking remained a priority and with the support of the NHS, smokers greatly increased their chances of stopping smoking for good.